We don't know exactly what President-elect Donald Trump will do in office, but we know enough to start our list of the best stocks to buy for a Trump presidency. Our very own Chief Investment Strategist Keith Fitz-Gerald appeared on FOX Business Network's "Varney & Co." just days before the election and said we could be looking at a "beautiful set-up for a rally" if Trump won. Our investing experts have a solid reputation for making prescient calls, identifying stock winners (and losers we can make money on, too), and guiding Money Morning readers to extraordinary gains. In fact, those who followed along with their recommendations last year did 166 times better than hedge funds (who returned barely 0.5% for their clients). That's why we turned to our experts to get their top picks for the best stocks to buy now, before President-elect Trump takes his place in the Oval Office on Jan. 20, 2017. These companies operate in sectors expected to flourish in coming years as Trump works to make good on his campaign promises. Some have already notched big gains since the election, but we see more upside ahead. Money Morning Director of Tech & Venture Capital Research Michael A. Robinson has written at length about a defense "supercycle" set to fuel huge profits for the sector over the next 20 years. And now with Trump headed to the White House and Republicans controlling both houses of Congress, we're about to see one of the biggest growth periods for U.S. military spending in decades. 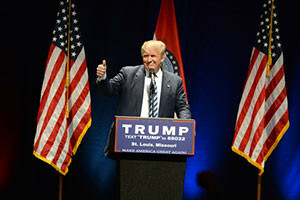 President-elect Trump vowed on the campaign trail to grow the U.S. military, which he says experienced deep cuts during the Obama administration. "It is so depleted," Trump said in a speech in Philadelphia on Sept. 7. "We will rebuild our military." Now U.S. defense spending could skyrocket by as much as $500 billion to $1 trillion during a Trump administration, according to Forbes. While the sector as a whole will benefit from this injection of cash, finding the best stocks to buy to take advantage of the boom in defense spending is no easy feat – so Robinson shared three of his favorites with our readers. These were already solid investments ahead of the presidential election, and they look even more attractive now. One is the largest defense contractor by market cap in the world and has a track record of landing the biggest projects and successfully bringing them to completion. Its shares are up 10% since the election, with more gains on the horizon. A 3% dividend sweetens the deal.